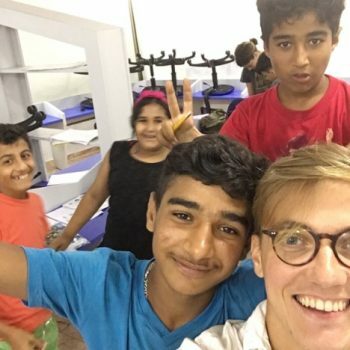 Thanks to the generous support of the Fares Center and Office of Career Services, I was able to join UNDP Lebanon’s Peace Building Project for two months this past summer. 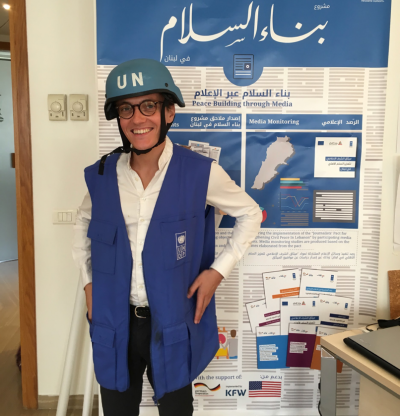 After focusing for one semester on conflict resolution theory and UN peace operations, this internship was the perfect opportunity to confront academic knowledge with reality. But it was especially the chance to discover Lebanon as well as Nadim Shehadi and Claire Wilson’s multi-faceted and long term project for the city of Tripoli that made me sign up for this summer adventure. As a French citizen, I have often heard and read about Lebanon, thanks to the cultural, linguistic and political bounds between the countries that remain very active. My Lebanese-French friends’ description of their homeland always attracted and intrigued me, therefore going to Lebanon did not feel like a random choice, but rather like a delayed encounter. Joining the UNDP Peace Building team facilitated my understanding of the country’s past and present challenge since the project (launched in 2006) takes a holistic approach with a multidimensional strategy. Through training programs, advocacy work, enhanced networking, media literacy and publications, the complementary initiatives aim to address the underlying causes of conflict in Lebanon and seek to create safe spaces for local identity groups to discuss their concerns and enhance mutual understanding. 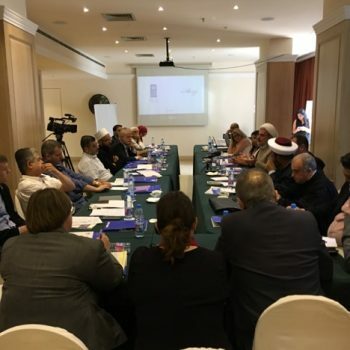 Although the project is active in all parts of the country and its offices located in Beirut, some of its aspects are particularly focused on Tripoli: like the Free Violence School Program and the local structural development of the organization Former Fighters for Peace. The former includes 15 schools (elementary and middle schools) in the Tripoli area with which UNDP develops tools, charters and trainings to address the spreading of violence among teenagers, often a side effect of the culture of conflict that remained active in Tripoli until 2015. The later concerns the NGO Former Fighters for Peace (FFP), gathering former high ranking officials from the different militias and armed groups who now advocate for peaceful dialogue and resolution of conflicts and share their memory of the war with younger generations who too often lack sufficient historical background. As FFP needs a stronger theoretical background to back up their strategy and a more local and decentralized structure, UNDP support their effort through trainings and consulting. Fortunately, Iwas able to work on both these aspects of the project, mostly through comparative research with similar initiatives in other countries or regions, highlighting the most efficient strategies and practices. A third initiative of UNDP Peace Building that kept me active during my internship – while it was not specifically designed toward Tripoli it was a useful tool for the city as well – was the “Peace Building Supplement”. 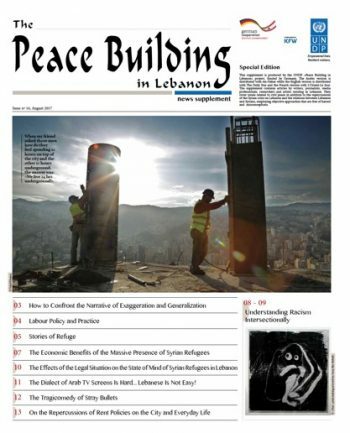 For the past four year UNDP has been publishing in collaboration with the three national newspapers L’Orient Le Jour, Al-Nahar and the Daily Star, a quarterly supplement covering issues related to civil peace in addition to the repercussions of the Syrian crisis on Lebanon and the relations between Lebanese and Syrians. The supplement differentiates itself from the rest of the press by employing objective approaches that are free of hatred and misconceptions, too often found in other biased media. I found the curating of the content and the articles published very powerful and original. It probably is the initiative I am the most satisfied to have been able to take part of, regarding the crucial role that media, public narratives and historic knowledge play in post conflict Lebanon. Despite the holistic approach of the peace building project, I found one missing part: the highlighting of a shared patrimony common to all minorities present in Lebanon. And as architectural and material patrimony can be the subject of heightened tensions between parties, the only one that belongs to all Lebanese people is the exceptional environment of their country. Trying to discover as much as I could all over the territory, I found myself mesmerised by the beauty and diversity of the Lebanese landscapes. From the Beqaa valley, to the luxuriant Chouf Montains, the cedars forests, the southern coast – who knew you could surf in the Mediterranean Sea? – the Lebanese people’s most precious wealth comes from their country’s environment. Unfortunately, like many other places in the modern world, it was as much painful to see the lack of respect and care given to it and how soil, water or air pollution are rapidly altering it. Enhancing people and communities’ awareness of their exceptional environmental wealth and its preservation should be fully part of an even more inclusive peace building project. Highlighting what people share, and the importance to preserve it cooperatively is an effective way to appease tensions and differences. ← Will Reconstruction in Syria be Tripoli’s Marshall plan?